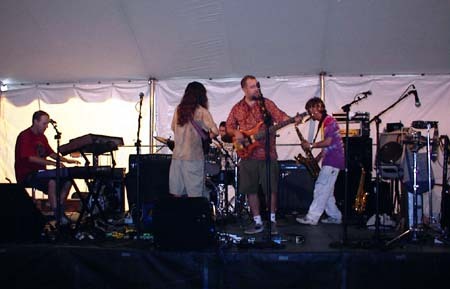 The improvisational, groove-rock band Ten Ton Chicken has performed over 150 shows to enthused audiences along the West coast since January 2001. Demand for Ten Ton Chicken on jam radio shows and via the Internet on MP3 has increased as the band continues to spread its wings. "In Search Of...", TTC.s second CD on Harmonized Records impresses with an eclectic selection of originals influenced by Funk, Jazz, Progressive, Blues and improvisational Rock. .In Search Of.. was recorded at iMusicast Studios in Oakland, CA and remixed/mastered at Skyline Studios by Grammy Award winning Rock 'n Roll engineer Michael Rosen (Santana, Joe Satriani, Huey Lewis). Released in February .02, TTC.s inaugural CD .Just Like in the Old Country. offers a studio/live mix highlighting the band.s eclectic array of jams.